Agilent Technologies Inc. (NYSE: A) introduced the enhanced Agilent U8903A audio analyzer with new digital audio interface options. These options expand the U8903A's capabilities with AES3, SPDIF and DSI (digital serial interface) formats for versatile, high-performance analog and digital audio testing. The DSI format offers four sub formats - I2S, Left Justified, Right Justified and DSP - for R&D engineers to analyze and verify a wide range of digital audio applications. The upgraded U8903A audio analyzer contains the full functions of analog domain and digital domain audio measurement in a single unit, allowing engineers and technicians to quickly perform complex cross-domain measurements in industries such as IC component and module design, wireless communications and consumer audio. The U8903A offers a wide logic level input range of 1.2 V to 3.3 V and allows users to set the logic level to any value within that range. This allows the U8903A to support and test future designs with continuously smaller logic levels in addition to the majority of current digital audio ICs. Built for ease of use, the U8903A is equipped with a 5.7-inch color screen (capable of displaying up to four channel results simultaneously) and one-button access to four main operating modes through the front panel softkeys. "With the new digital audio interfaces, the U8903A audio analyzer shows Agilent's commitment to providing high-performance solutions for the continuous challenges in audio applications," said Ee Huei Sin, vice president, Agilent's Basic Instruments Division. "This product continues to build on the legacy of the HP 8903B audio analyzer from two decades ago." 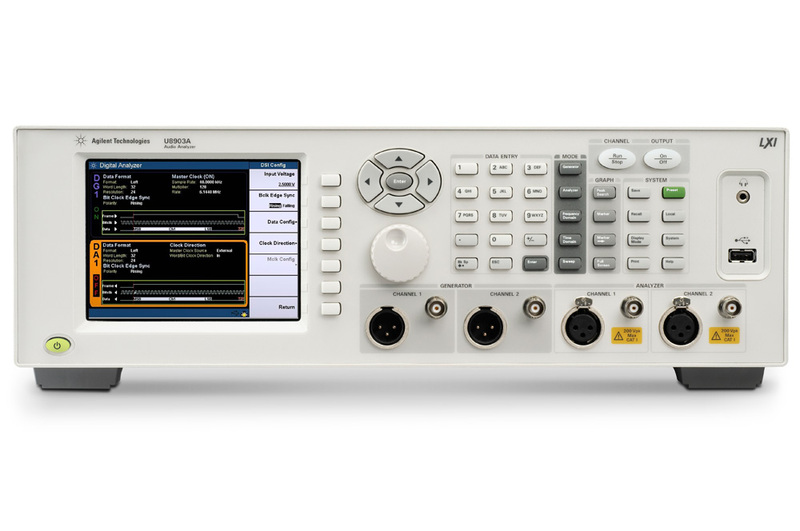 Existing U8903A users can obtain the digital audio interfaces by opting for a hardware upgrade, which includes installation of selected digital audio interface options and calibration of the U8903A unit by Agilent's Service Solution Unit. The Agilent U8903A audio analyzer with analog functions only is priced at $12,000. The U8903A can be further expanded with digital audio interface options. The U8903A with Option 113, which provides both AES3/SPDIF and DSI digital audio formats, is available for $16,400. Option 114 includes the U8903A unit with AES3/SPDIF digital audio interfaces only, while Option 115 includes the U8903A unit with DSI format only. They are priced at $14,850 and $15,300, respectively. The audio analyzer and digital audio interface options are available now. Information about the U8903A audio analyzer and the new digital audio interface options is available at www.agilent.com/find/audioanalyzer. High-resolution images of the U8903A audio analyzer are available at www.agilent.com/find/audioanalyzer_images.